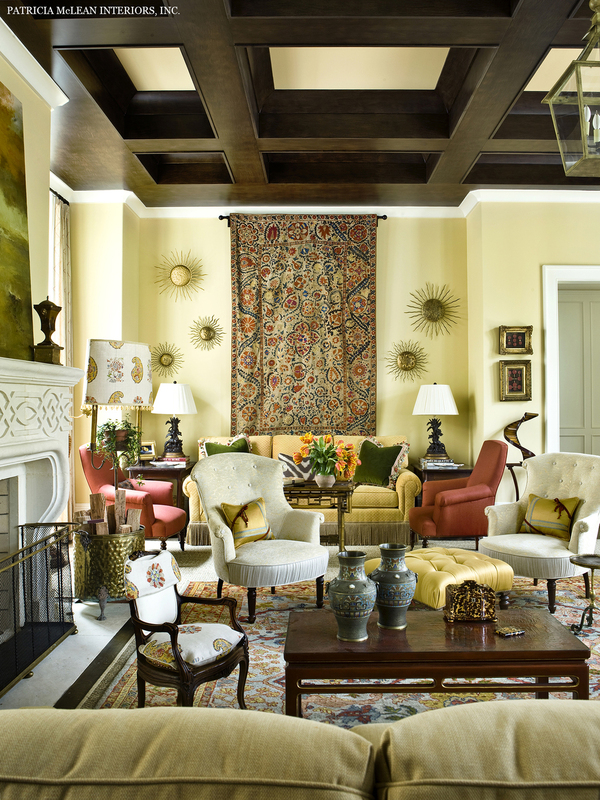 2011 Atlanta Symphony Associates' Decorators' Show House — Patricia McLean Interiors, Inc. The 2011 Show House family room is large and serves as the heart of the home. Patricia had an architect on staff who helped draft the floor plan, which is essential for working with a room of this scale. There are several seating groups with French slipper chairs and sofas, the antique French game table, the music space with grand piano and the seating at the Spanish desk. The result of so many groups is that it humanizes the space, making a large room feel cozy. All fabrics are No. 9 Jim Thompson. The linen print fabric at the windows establishes the color palette and the border has been cut and reapplied with the saffron banding to highlight it. The print is used around the room on a 54-inch octagonal table skirt, custom lampshades at the fireplace and seat slip covers at the desk and baby chair. The steel windows to the lotus pond are treated with a linen sheer with an embroidered zigzag pattern. All drapery rods are custom. The wall color, custom-mixed by Patricia, is named "Tricia's Tuscan Yellow." The lamps are a mixture: antique Italian iron floor lamps have custom lampshades, the shades for the lamps at the windows are of hand-crafted paper and, at the fireplace, the lampshades are of printed fabric with a Murano glass bead trim. A Staffordshire figure of a prince on horseback is at the first window. French marble at the center sofa, orange tole at the desk, saffron ceramic at the game table and a pair of hand-carved Black Forest wooden lamps in the niche also are featured. Ceiling lanterns are in a painted finish. The most interesting upholstery pieces are the antique French slipper chairs that Patricia bought for this room. The chairs are covered in casual, durable fabrics and Jerry Pair leather with special trims from Samuel and Sons. Bullion fringe is used on both comfortable sofa skirts. Case furniture includes a tall, slender antique French buffet deux corps at one end, a Spanish desk with iron base at the front, an Italian chest with fabulous inlay at the middle window, an exotic Japanese bamboo tea table and an Asian lacquered coffee table in the center of the room. End tables are French, Italian, English and Dutch with tambour doors. The painted French tall case clock and Blackamoor tables at the glass doors add a painted finish dimension. The antique rug is a Ziegler Sultantabad. The wall hanging on the back wall is an antique Indian Suzani. On each side are iron star ceiling lights from Barcelona mounted as art.